Following the success of the National Basketball Association’s (NBA) “BIG Color” holiday campaign in 2012, the league announced today the continuation of the BIG holiday tradition by unveiling a new “BIG Logo” platform tied to the marquee Christmas Day matchups. As part of the holiday campaign, adidas will unveil new uniforms featuring team logos that all 10 teams will wear on Wednesday, Dec. 25. 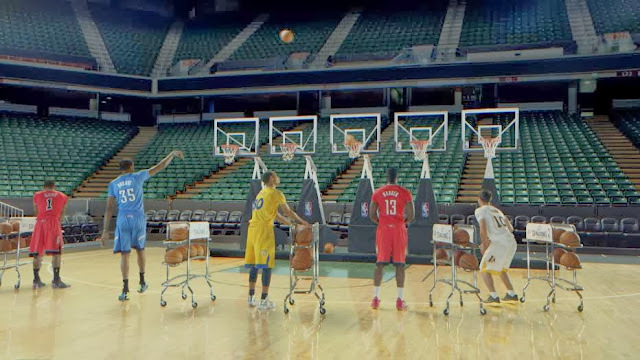 The campaign will include a TV spot titled “Jingle Hoops” to promote the jerseys featuring six players: the Miami Heat’s LeBron James, the Oklahoma City Thunder’s Kevin Durant, the Chicago Bulls’ Derrick Rose, the Houston Rockets’ James Harden, the Los Angeles Lakers’ Steve Nash and the Golden State Warriors’ Stephen Curry. On the heels of last year’s award-winning “BIG Color” campaign that garnered more than eight million YouTube views, the featured players recreate the wintertime classic “One-horse Open Sleigh” through a series of choreographed three-point shots – all while dressed in their “BIG Logo” uniforms. Beginning today, “Jingle Hoops” will be live on the league’s digital platforms and will air across the league’s national broadcast partners ABC, ESPN, TNT and NBA TV, as well as its regional sports networks. In an effort to reach basketball fans around the world, the NBA will also air international versions of the spot in key regions including China, Europe, Mexico, Brazil, Africa, and the Middle East. Highlighted in the spot are the new “BIG Logo” uniforms that feature team logos in reflective chrome as the focal point on the short-sleeve jerseys. To complete the uniforms, the jerseys are paired with an ultra-lightweight short with chrome piping. 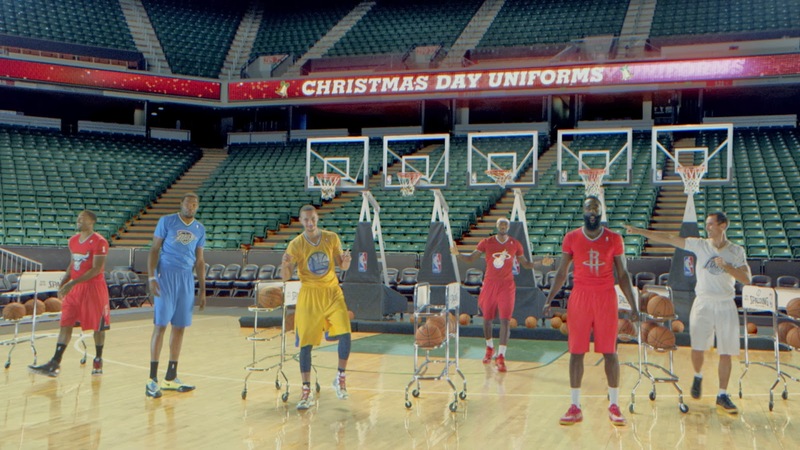 “We worked closely with adidas to create an innovative new uniform design for our Christmas Day games,” said Sal LaRocca, NBA Executive Vice President, Global Merchandising. "The BIG Logo collection will provide a unique look oncourt and a variety of products for our fans." The uniforms are part of the adidas NBA “BIG Logo” Holiday Collection, which includes new warm-up jackets and shooting shirts that feature print graphics inspired by knit holiday sweaters. The warm-up jackets feature team logos on the front chest and BIG team logos on the back, both made of chenille patches. Fans can purchase the adidas NBA “BIG Logo” Holiday Collection at NBAStore.com, the NBA Store on Fifth Avenue in New York City, and team retailers beginning on Thursday, Nov. 14. The NBA is a global sports and media business built around three professional sports leagues: the National Basketball Association, the Women’s National Basketball Association, and the NBA Development League. The league has established a major international presence with games and programming in 215 countries and territories in 47 languages and NBA merchandise for sale in more than 125,000 stores in 100 countries on 6 continents. NBA rosters currently feature a record 92 international players from 39 countries and territories. NBA Digital’s assets include NBA TV, which is available in more than 61 million U.S. homes, and NBA.com, which averages more than 42 million page views per day, more than half of which originate from outside of North America. The NBA is the No. 1 professional sports league on social media, with more than 475 million likes and followers globally across all league, team, and player platforms. Through NBA Cares, the league and its teams and players have donated more than $225 million to charity, completed more than 2.6 million hours of hands-on community service, and created more than 830 places where kids and families can live, learn, or play. Adidas has been providing innovative products for the world’s best athletes for more than 60 years, from past legends to today’s superstars, such as Derrick Rose, Dwight Howard, Tim Duncan and Candace Parker. On April 11, 2006 adidas and the National Basketball Association signed an 11-year global merchandising partnership making the adidas brand the official uniform and apparel provider for the NBA, the Women’s National Basketball Association (WNBA) and the NBA Development League (D-League) beginning with the 2006-2007 season. Artistang Artlets of UST Presents "Dyip"